4.3 out of 5 based on 98 bloggers and 79 commenters. 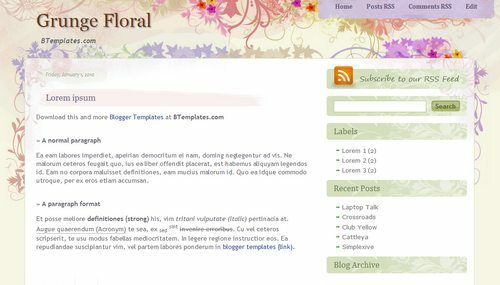 Grunge Floral is a free blogger template adapted from WordPress with 2 columns, right sidebar, rounded corners, grunge style and floral motifs. Excellent template for blogs about to write a diary. hi, I really love your template but i don’t know what i did, the flowery background is gone! Could you pls tell me how to put it back? Thanks! sure! BTW I have add the navibar, not sure if that has affected it. Thanks!! wow! the flowery background is back! thank you so much! @Volverene Evo: oh, another question. How do I change the font/colour in the “about” category/box? @Leia: Do you mean on the sidebar, Your Blogger Profile ? I just have one request and one question. The request is, how can I have the tag/label under the title and not after the post? and the question is: Is it normal to have a so big gap bewteen the last line of the comment dialog and the permalink dialog? @Ptinutz: Thanks for the nice feedback. 1. Goto EDIT HTML page. 4. Click SAVE and VIEW BLOG to see the page navigation links come back again. Thank you for your quick answer. I made the modification, but the gap is still there. 5. Click SAVE TEMPLATE and then click VIEW BLOG. @Ptinutz: Then I think it is normal to have a big gap bewteen the last line of the comment dialog and the permalink dialog. I’m sorry I couldn’t help you anyway. @Volverene Evo: Thank you anyway for all your efforts. I tried the page navigation fix in your June comment post but cannot find either link referenced in step 2 so I’m not sure where to paste the replacement link. How else can I repair the lost page navigation? I did paste the link into the html code in an effort to repair the lost page navigation but it did not fix the problem. What can I do so visitors can travel to older posts or different pages? Save changes. Does it work? Thanks, Claudia! Greatly appreciate the reply! I did remove the code. It didn’t bring back the page navigation bar but at least I have an Older Posts link on the first page. But the Older/Newer Posts button is not at the bottom of any following pages. Any advice how I can fix that? I made the adjustment noted in the August 29 comment re:paginator margin and that seemed to fix the issue on subsequent pages. That solves the biggest issue at this point. Thanks again! Hi, I’m having th same problem as Alice above. I cannot see the older/newer posts button and I have tried so many things to help but nothing works. It worked at first but not anymore. Infelizmente , terei que trocar por outro modelo de template. This is a beautiful template, thank you for sharing it. Could you please let me know how to make the font in the actual blog, darker? At the moment it shows grey and I would prefer it to be a darker colour.